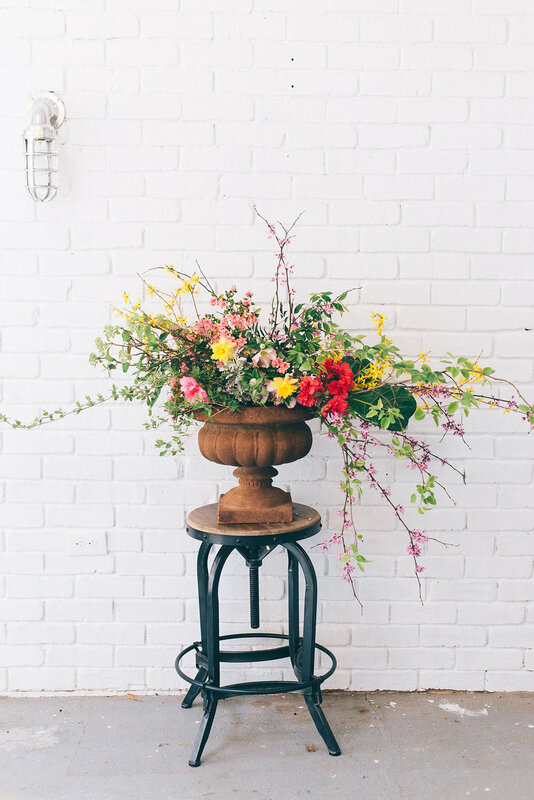 If we haven’t stressed it enough, spring is a floral designer’s dream season. It not only marks the beginning of wedding season, but also the time of year where everything begins to bloom. What could be better! The amount of blooming branches, flowers, and fresh greenery that is available all around us during spring is simply wonderful, and we love taking advantage of all the free goodies nature has to offer. As floral designers, we aren’t always playing with flowers as you probably think we are. We tend to get stuck behind our numerous screens writing endless amounts of emails, proposals, blog posts, and not to mention the hours spent boosting our social media. In order to take a break from this every now and then, we have to close our computers, put down our pencils, and walk outside to enjoy the beauty that is right outside our blue studio door. The other day Amanda and I took the time to not only walk outside, but we challenged ourselves to create an entirely foraged bouquet from only what was available to us outside. We walked around snipping and plucking and ended up with an extremely beautiful bundle of blooms and greenery. I feel as creatives, it is so important for us to take a break and let our brains explore creativity outside of what we normally do. Play around with new techniques, new ways to think through a project, all of this helps our minds stay active and fresh in this industry where we sometimes tend to be overloaded with images and ideas. The result of our spontaneity turned out to be a stunning spring bouquet featuring forsythia, hellebores, several varieties of azaleas, daffodils, honeysuckle vine, fresh baby greenery, dusty miller, our very own studio fiddle leaf, and red bud. Not only were these flowers completely free, but they were also grown locally (obviously since they came out of the backyard). Most of the plants have been growing in this yard for years and years, but the other half, Amanda and her husband Michael planted with their own hands and have watched as they’ve grown bigger every year. My point here is, that these flowers and blooming branches didn’t come from all over the world like most of the flowers designers use. There are so many plant varieties around us that can be used to create beautiful designs and they don’t have to come from all over the world. 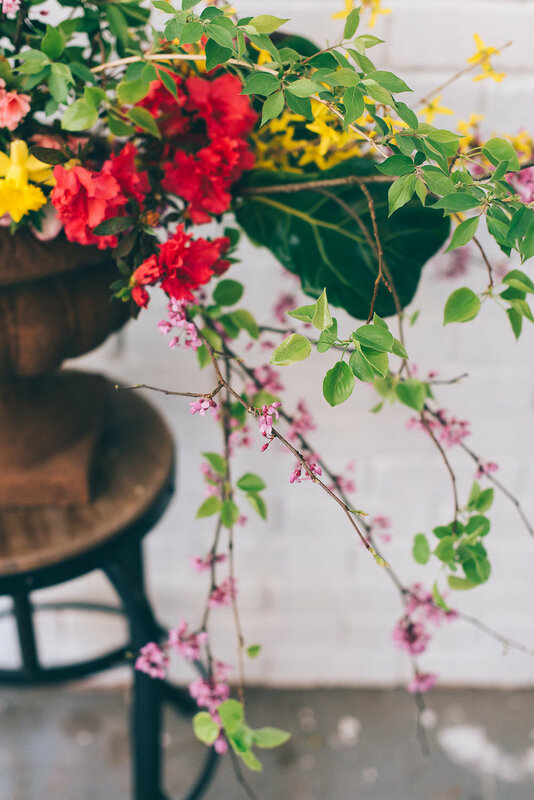 How amazing would it be to design a wedding using all foraged greenery and flowers?! Amanda and I would love to do this one day. Is anyone up for this challenge? I wish it were more possible for us to use locally sourced flowers for every event we design, however the availability for locally grown flowers is still pretty low in Georgia. There are a few farms that are bringing the Slow Flower Movement to Georgia, however we can’t wait until more people realize how important it is to grow locally. Our friend Shelby, of Shelby Rae Photographs, came over to play with us in our studio and captured our foraged bouquet in so many beautiful ways with her camera! We had so much fun playing around with it and we wanted to share it with you. A big thanks to Shelby for encouraging our spontaneity, it’s something we are going to start doing a lot more of! PS: How awesome is that handmade potting bench that Michael made? It was crafted out of salvaged wood from Amanda’s grandparent’s lake house that she grew up at. This wood is over 50 years old and was the deck on the back of the house. Now it serves a completely new purpose as our potting bench for our studio!